Can you guess what I like the best about the traditions of monks? Come on, go ahead and guess what I like the most from all these Belgian Abbeys and Trappist monks. You guessed the beer, right? WRONG: It’s the groundwork experiments by Gregor Mendel that lead to the science of genetics. But a strong tradition of beer is a close second! The monks definitely loved their beer, spending generations perfecting their craft. If you were in a life that was 50 percent poverty and 50 percent Bible study, wouldn’t you need a good drink now and again? I guess they liked to pay more mind to quotes like Ecclesiastes 9:7 than they did to Ephesians 5:18. Either way, this is a highly recommended brew. It’s got world-class ranks on the two big beer-rating websites, as well as a laundry list of accolades. At 10.5 percent alcohol by volume, it was certainly enough for the most indulgent of friars, but I was happy with just my one goblet. Generally, any Belgian style ale above 10 percent is a Quadruple, but outside of that there is no strong definition for what is or isn’t considered a Quad. But if you see a Belgian, especially one with ‘Abt’ -the abbreviation for Abbot – and the number 12, then it’s probably a quad. This particular one pours hazy and rich, almost purple brown. There’s a bit of a fluffy head, but it quickly subsides into a very lacy ring. It gives off a scent that is very similar to some good barley wines. It has plenty of dark grape and raisin flavors, some of that dark candy syrup, and some distinctly Belgian yeast. I also got a bit of a boozy hit to the nose, but I will chalk that up to the temperature it was served at. You see, I had it in one of those places that have something like 50 taps, but is still mainly a chain-restaurant. It’s just kind of cruddy how even though you have this big walk-in fridge full of taps, the beer is just kind of hanging out in these tubes suspended overhead. Especially if you get a less popular beer, there isn’t much chill left to it by the time it hits your glass. A glass, which by even a greater degree of likelihood, was probably placed at the bartender’s station just steaming hot from the automatic dishwasher. Just a cautionary tale on why you should support your local mom ‘n’ pop brewshop. Anyway: The taste. Surprising, to say the least. You get just a cornucopia of dark stone fruit. More of the grape and raisin, but then some date and fig as well. Yes, and plenty of that unique Belgian yeasty funk. In fact, this is one of the first Belgians I had where the yeast wasn’t played up so hard that it was obtrusive, or where it was so unremarkable that I barely noticed. The yeast in this was playing a second string, but doing the hell out of it, just a perfect balanced portion, right where this rockstar belongs. There was still a noticeable booze heat to it, especially at the end. However, it wasn’t entirely unwelcomed. It acted almost as a bit of a palate cleanser, keeping me from getting too much of a sticky aftertaste. After finishing, I could see why this brew got such great ratings. As far as Quads go, or even Belgian Abbey styles, this one is just downright… Heavenly. I could see myself really enjoying this anytime, or even after a long day of scripture copying and gardening. Yes, something tells me the monks of St. Bernardus Abbey have got it pretty good. Well, something along that line of thinking inspired Dogfish Head to not only create a beer that sourced as much cred from the four corners of the globe (it has been a while since highschool geometry, but I do not believe spheres have corners), but did it democratically. People on the internet voted on ingredients to represent a region’s flavor, and Dogfish Head decided on the best. Ok, so that isn’t exactly democratic, but I can’t imagine the most popular flavors would have ended up being the best beer. The brew-meisters concluded on having wattleseed (Australia), toasted amaranth (South America), rooibos tea (Africa), myrica gale (Europe), and good ol’ honey (North America). The lineup, at least the parts I was familiar with, looked interesting. Great stuff… But where’s Asia? That’s a pretty fast and loose way to call continents, Dogfish Head. Just because they are technically not separated by water doesn’t mean it’s one big homogeneous island. I was tempted to just put a dropper of soy sauce in just for the principal of it, but I steadied my skepticism. We’ll see if Dogfish Head can salvage themselves from this international shame-fest. At 8.1% ABV, this is a solid sharing-sized dubbel. It pours a crystal clear dark brown, with a little tan head. The head dissipates quickly, releasing it’s payload of coffee and spice scents. No hop aroma at all, possibly overshadowed by all the toasted cereal grains, black pepper, and fruity esters. The toasted amaranth contributes to the grainy profile, which is it’s culinary purpose in South American cooking. There is also a backing of some sweet caramel and toffee notes from the Belgian dark candi syrup they added. A very complex nose to say the least. However, we all know beer isn’t just for smelling. The first note I got from the taste was that funny, unique honey taste. Interesting note: they are using Hiveplex honey, which is -no joke- the beekeeping arm of Google Inc. It’s just odd to think that they make one of the world’s oldest ingredients, which is in this beer, as well as being the omnipresent electronic shepard we use daily, possibly to read this very article. How very… Zeitgeisty. After a taste or two, getting past the usual suspects of pilsner and chocolate malts, you get this very floral air to it from the African rooibos tea. Second fun fact: rooibos tea is actually not a tea, but an herb that is more closely related to coffee than tea. This is turning into a real learning experience. The slight bitter character present in the lingering tastes of this beer is more from the myrica gale, a substitute for hops in beer up until about the 16th century. It does add a certain hop-like resinous feel, and is a good offset to the big, dark flavors that inhabit the rest of this beer. Overall, a greatly complex dance made up of some very unusual dancers. There’s plenty to taste in this, and definitely worth parsing through. I’m hoping that this beer does what Dogfish Head intends and inspires other craft beer makers to take a look at some of the more left-field and far off ingredients that can put a very unique face on a beer. This is a good beer for being worldly and sophisticated, and you can enjoy it with good knowledge on the eclectic mix of flavors inside. But still, couldn’t it have done with even a little bit of something Asian? La Folie - New Belgium Brewing Co.
I’ve touched on some other beers from the Lips of Faith line by New Belgium, specifically the Cocoa Mole from a while back. But at a recent beer event, New Belgium was sampling the 2012 version of La Folie, their sour brown ale. Past years have been quite popular, but I have been missing out on trying them. Unfortunate, because word has it that this is a danged good beer, and a good beer to cellar. It is aged in French oak barrels before bottling, and keeping a bottle in a cool, dark place for about a year will highlight things like that, the malt character, and maybe a few other bits of it. The 2012 version is, by all accounts, similar in nature to the earlier vintages when they were new. Maybe a little more tart, but this is a sour beer we’re talking about. It is one of my favorite varieties, but I wouldn’t say that makes me a ‘lemon head’ or ‘sour cherry’ or whatever sour version of an IPA aficionado would call themselves. No, I prefer a good balance and complex flavor profile when it comes to sours. So of course, I turned an inquisitive eye towards this one and bought a bottle. This beer pour a chestnut, slightly reddish brown. Right off the bat, without even really trying, you get the sour notes to the nose. As soon as it starts forming the light, fluffy head, you get some tart cherries and a bit of that barnyard funk. Yes, you get a healthy dose of brettanomyces there, but it is definitely outplayed by the sour scent. Not so much a vinegary sour, but a very fruity and natural kind of sour. I gave it a cautious sip, and got a small taste of just plain ol’ tang. In the taste, it definitely gets more vinegary and lemony, but it is mellowed out by the well-rounded blend of pale, munich, and chocolate malts. With a bit more tasting, you can get some of the hops, but they do not add much. Just a little bitter linger at the end after the drawn out sour taste wears off. So, I guess by now you can guess that the main arena of flavor in this is ‘sour’. But unlike some other sour beers, this one isn’t quite so straight forward. It is almost as if there is some kind of sour blend going on here. You get the lemon and the sour cherry, that’s for sure, but you also get this kind of blue cheese funk from whatever sourness the brettanomyces and lactobacillus is lending. After getting over the initial shock, I came to see the whole sourness to be more tannin than anything else. Kind of a red wine blended with a beer. Overall, a great experience in sours. A fun thing to mention is the food pairings. New Belgium’s website is very well stocked with gourmet pairing ideas from chefs who’ve sent their ideas in, but one that stuck with me as a particularly good match was a wild mushroom crusted Colorado lamb rack with cipollini puree, polenta, and rainbow chard in lamb reduction. It matches well in both the tartness matching with the gamey lamb, and also the acidity of the beer cutting through the fatty and lingering flavors of the sides and reduction. It would be a great palate cleanser, almost vying for greatest interest of the meal. Knowing that this beer ages quite well, I’m going to have to stick it in my slowly growing area of my closet where I am aging beers. This will be my first sour to age, but hopefully I won’t have to wait for it to be my first cellared sour I taste. How did I choose this beer? Well, in an aisle full of dragons and dogs and clowns and whatever else people put on their bottles these days, there was one that didn’t quite fit the mold. It instead was blazened with the face of 1800s German philosopher Friedrick Nietzsche, captioned with the beer’s name, “Existent”. His mustachioed visage reminded me that I have a philosophy major girlfriend at home, and this could be a fun treat for the both of us. She is more of a Jean-Paul Sartre fan, but I didn’t see any bottles with him on it. However, I suppose I could have made a Sartre beer by watering down the Nietzsche. I’ll just go ahead and high-five myself for that wicked philosophy burn. 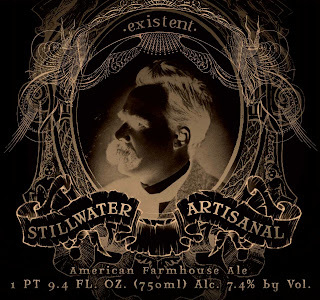 Stillwater Artisanal Ales was not a brewery I was very familiar with. Maryland isn’t exactly known for their beer, but this is one lineup of beers that can really turn your head from the crab cakes and John Waters films. Every beer on their list is something really unique and interesting, and they even have a collaboration with Mikkeller. Existent in particular is an American farmhouse ale, explained on their website as “Deep and dark, though deceptively dry, braced by a firm but smooth bitterness and accented with an earthy hop and mild roast aroma.” Interesting, but I thought a farmhouse ale or saison was a light summery beer? Well, that does seem to be the general idea, but saisons are just not that well defined. The description on the website does indeed end with such a sentiment, “This is an ale for you to define, ‘and if you gaze for long into an abyss, the abyss gazes also into you’ – Friedrich Nietzsche.” Chilling. At first pour, I was absolutely taken aback with how dark it was. I mean, I know it said it was a dark farmhouse ale, but this is right in porter territory. It riles up quite the dark head as well, almost coffee colored. When you get a whiff of it, you can start to see the saison qualities come out. There is just a bit of a tart fruit scent from the Belgian yeasty funk. Plenty of those toasty malts, and just a bit of hops too. It’s good to see the hops come out in the scent, as long as they do not overpower in the beer itself. Either way, an interesting scent overall. The taste was a real treat. The first thing I noticed was just how well balanced it was. The malts set off the hops perfectly, all complimented by the yeast and spicy characteristics. Truly a hallmark of a good beer. After a few tastes, I was getting notes of orange peel and peppercorn, with a bitter chocolate aftertaste. Some really interesting things going on in this beer, that is for sure. It finishes just as strong as it ends, which is a little taxing if you are not up for it. Personally, it was just fine split a little over two ways (gave a tulip glass to my roommate), but I couldn’t see myself drinking any more than that in one sitting. Not for the 7.4% ABV obviously, but just the overbearing experience it is. It is great, no doubt about that, but I can only enjoy something good for so long before I need a break. Stillwater also does a version of this that they age in bourbon barrels in 12oz bottles. Now that would be a really interesting addition to this. Not only would they be improving the flavor, but they would be rationing it out in more bite-sized chunks. It would also seem that this un-aged Existent could use a bit of a fuller-bodied oak or bourbon vanilla sweetness. If I ever see a bottle, I’ll be sure to gaze into this abyss once more.